Donna and Martha were so excited. After agreeing to the ‘80’s dance party, the three of them went into the rec room where they had held the Doctor’s birthday party and began to fix things up. Rose helped for awhile until the Doctor called for her to come to him. Since then, Martha and Donna had been working alone. “Wonder where Rose went?” Donna asked. “Probably went off for a make out session with the Doctor,” she said. They looked over when Rose came into the room. Their eyes bulged out of their heads when they saw her hair. It was teased, crimped and bright purple. “Like it? It’s for the party tonight,” Rose said. “Wait, you actually got your hair dyed purple?” Donna said. She walked over to Martha. “Is he going to get Jack and Ianto and Gwen?” Donna said. They ran out the door while Donna finished putting chairs in place in front of the tables. She grinned when the TARDIS teleported huge bowls of crisps, dip, sodas and sandwiches onto the tables. Grinning, she reached in, grabbed a crisp and munched on it while she sat plastic cups in front of the bottles of sodas. Her head jerked up when she heard Martha’s howling laughter coming from somewhere in the TARDIS. “Oh blimey, now I wonder what the Doctor looks like,” she muttered. Rose came back in a few minutes later carrying a stereo in her arms and giggling hysterically. “Did you hear Martha?” she asked. She helped her set up the stereo on another table and plugged it in. “Doctor’s got a bunch of CD’s he’ll bring in before the party starts,” Rose told him. Suddenly, Martha burst into the room. They turned and laughed. Martha’s hair was teased up with red highlights. “Oh my God, I love your hair like that, Martha, it’s so cute,” Rose said. She walked over to Donna and put her hands on her shoulders. “Okay, you guys talked me into it. I’m going,” Donna said. She followed Rose out of the room while Martha finished setting up. They went through several corridors before coming to an open door. “Yes?” they heard him say. Rose and Donna stepped into the room and Donna’s mouth flew open while she stared silently at the Doctor. Donna was completely in shock. The Doctor had colored his hair bright pink, had on eyeliner and was wearing a Michael Jackson Thriller jacket, sequined glove, parachute pants, sequined socks and Reeboks. He giggled at Donna’s expression. “Why, Donna, you seem surprised to see me like this,” he said as Rose bent over laughing. “Hey, if it’s the ‘80’s, I gotta look the part,” he said. Donna glanced at Rose and walked over to the chair. She sat down in it while the Doctor lowered a metal dome over her head. “Not shocking pink, that’s for bloody sure,” she said, glancing at the Doctor’s hair. “I think you should turn it blue and white,” Rose said. “What, like half and half?” the Doctor said. The Doctor looked down at Donna. “Your thoughts?” he said to her. “I think you’re off your rocker, but I guess that’s not what you meant,” Donna said. “Okay, blue and white then,” she said. “How about blue and silver?” the Doctor said. “No, blue and silver will do just fine, thanks,” Donna said as the Doctor and Rose laughed. The Doctor used a little keypad on the side of the dome and programmed the instructions in. Once he was finished, he pushed a button, there was a flash and he raised the dome up. Both he and Rose giggled at her blue and silver hair. The Doctor gave her a hand mirror. Ianto set the boxes down on a desk, opened them and the three of them reached in for a slice. They stood together, eating and talking when suddenly all three of them heard the familiar sound of the TARDIS. He sighed when he realized the TARDIS was landing around them again. The TARDIS finished materializing around them and they noticed they were back in the rec room. 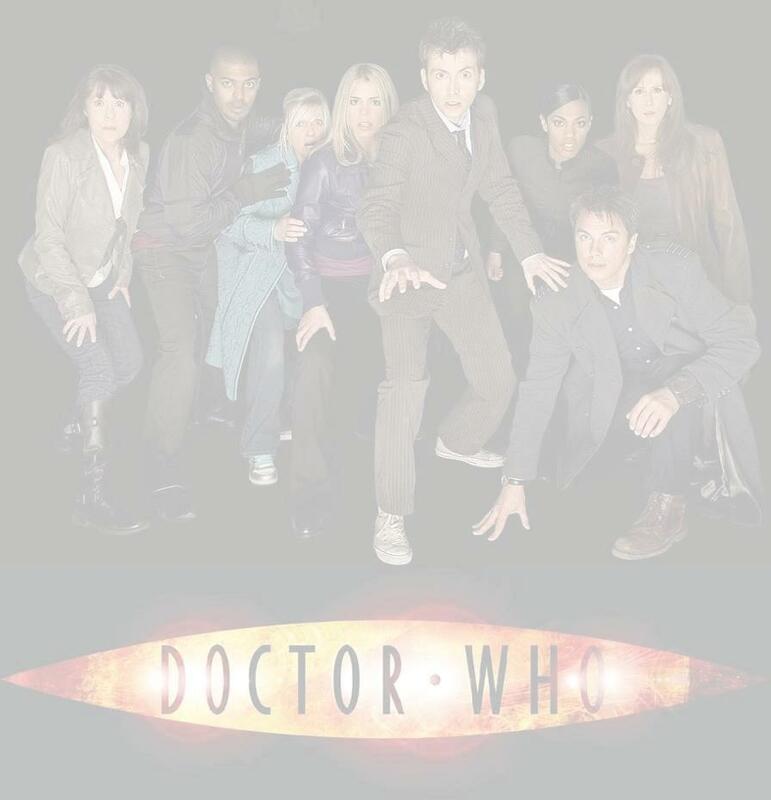 Their eyes widened when they saw Rose, Martha and Donna standing in front of them. “We’re having a 1980’s dance party and the Doctor decided to invite you guys,” Martha said. The Torchwood members looked at each other. “Yup and if you want to look just as bizarre, the Doctor can fix that for ya,” Rose said. “No, thanks, I’m not a fan of LSD-induced dye jobs,” Jack replied. “Are you sure it’ll change back?” Ianto asked. “He better not or I’ll shove his eyeliner pencil in his eyes,” Donna replied. “Wait, did I just hear you say eyeliner pencil in reference to the Doctor?” he asked. The three women giggled and nodded. “Oh, Jesus, where is he? This I gotta see,” Jack said, looking around. They turned when the Doctor came in the door. Jack, Gwen and Ianto’s mouths dropped open when they saw him. “You have got to be kidding me,” Gwen said. “PINK? You colored your hair pink?” Jack said. He grinned when Jack put his head in his hands. “Oh God, you have done some idiotic, strange things since I’ve met you, but this takes the cake right here,” Jack said. “Not me, I like my hair the way it is, thanks,” Gwen said, holding up her hand. “I double, triple, quadruple dare ya,” he said to her. “Excuse me? When was that decided?” Ianto said. He grinned at his lover. “Not in a million years, Jack,” he said to him. Ianto stared at his hair. “Green?” he said to him. “Okay, then I will be on the other side of whichever side you’re on the entire party,” Ianto replied. “What if we don’t want to?” Gwen said. The Doctor snickered when Gwen and Ianto sighed and followed Jack. “Green, nice choice, Harkness, “the Doctor said as he led them out of the room. The three companions laughed when they heard Ianto say, I’m not coloring my hair silver and blue, Jack! Looking at each other, they began to eat some of the food while they waited for everyone else to return.